Washington (CNN) Legal immigrants and their attorneys say they are facing unprecedented challenges to come to and stay in the United States under the Trump administration — and with attention focused on DACA, they’re wondering: What about us? 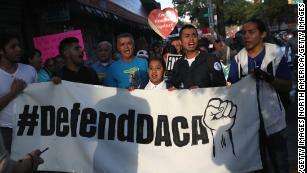 President Donald Trump’s bid to end the Deferred Action for Childhood Arrivals program, a policy that protected young undocumented immigrants who came to the US as children from deportation, has dominated headlines on immigration. But immigrants who came to the US legally and the attorneys who work with them say they are facing a new world with this administration, where virtually every form of legal immigration to the US is under siege. The concerns are wide-ranging: Legal immigrants who came to the US as children but waited upwards of a decade before their family could get a green card — only to be too old to count as immediate family. High-skilled immigrants who have had their visas continually renewed as they wait for a green card who now face new scrutiny. Employers who are worried about being able to hire the temporary seasonal workers they have in the past. Immigrants who feel the administration considers all foreigners a threat.